A year ago I started this blog with my very first recipe documented 'Classic Smoked Salmon Eggs Benedict w/ Homemade Hollandaise Sauce'. Looking back, my style of blogging has definitely changed a lot - more creative ideas for recipes & definitely better food photography & props. And just weeks ago I've decided to refine, restyle & reshoot on previous recipes which I think it's necessary to develop this blog further to have a specific style as a whole. To achieve the ultimate eggs benedict that I envision it to be, I've refine the recipe (from the previous classic) & came out with recipes including Buttermilk English Muffins right from scratch. Furthermore, instead of using smoked salmon, I incorporate the usage of shrimps with butter poaching to create that melty & buttery texture. By butter poaching, I don't mean to submerge the shrimps in butter on direct heat, instead I'm using a medium to contain the shrimps and butter to submerge into the water. If not, you'll never be able to get that velvety texture. Many think it's not easy to make hollandaise at home. Well, its kinda true but I have to say it's not that difficult once you get the technique right. You'll be surprise this technique is really useful in making many different types of sauce, jams etc. Most importantly, you get to enjoy eggs benedict by making your own instead of spending tons in cafes & restaurants. Basically, hollandaise are made mainly of egg yolks w/ melted butter and some seasonings, nothing too complicating. To make it even tastier & interesting, I added in salted egg yolk (by sifting it through a fine mesh) for that extra flavor which give this classic recipe a whole new life to it. Held the water at a specific range of temperature where the surface of the water are still. (instead of vigorous boiling) The ideal temperature for poaching is about 70C/140F - 85C/170F. What I usually do is have about 1 part of water to 4 parts of boiling water, and adjust the heat to low. Crack the egg in a bowl first instead of cracking it directly into the pot of water. Always use fresh eggs, as they have a strong layer of egg whites surrounding the yolk which is really important throughout the process as it helps to bind the poached eggs together. 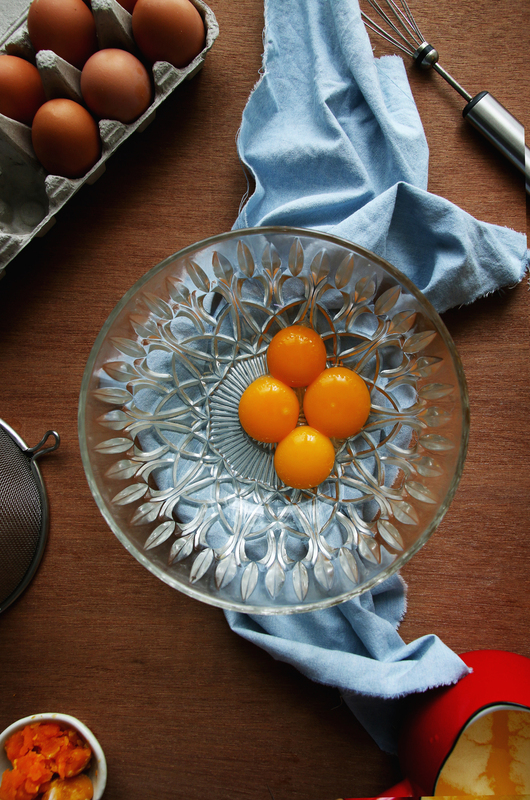 If the eggs are not fresh enough, create a whirlpool in the pot of water by stirring it in circular motion. Then slide in the egg. You can only poached the eggs one at a time using this method. Use a comfortable straining ladle to scoop out the eggs once it's done. Note: For the classic hollandaise sauce, omit the sugar, add in 1 tsp of white wine vinegar and 2 tsp of lemon juice to taste. Prepare a pot of boiling water and set it aside on low heat. 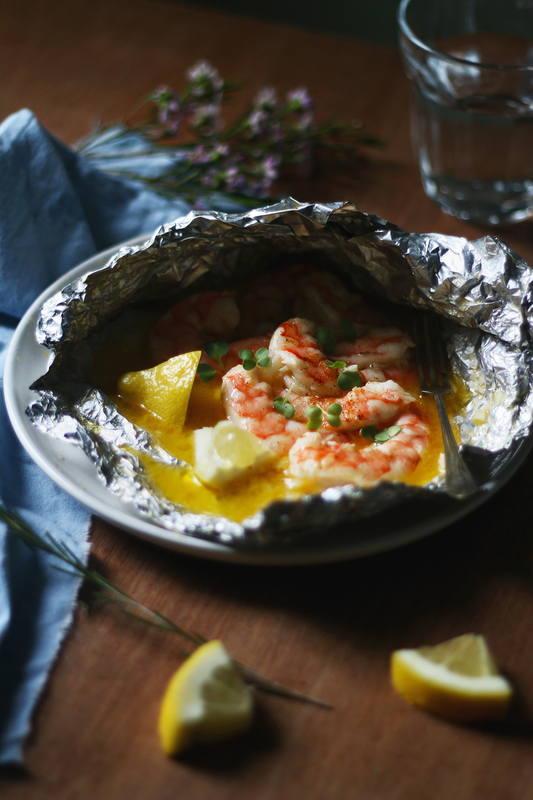 Using a aluminium foil, wrap the shrimps with melted butter, garlic, salt & pepper into a pouch like shape tightly. Alternatively you can pack it into a heat resistant plastic bag. Have about 1 part of room temperature water into 4 parts of boiling water (in the pot). If you have a thermometer check the temperature, it should be ranging in between 70C/140F to 85C/170F. The surface should be still, and small little bubbles can be seen forming at the bottom of the pot. Once the temperature is right, submerge in the pouch and let it sit in for about 10-15 minutes (depends on the size of the shrimps) on low heat. After its done, sliced the shrimps in half from the side. drizzle with lemon juice before serving. In a glass or metal mixing bowl, sift the salted egg yolks through a fine mesh. Then add sugar & egg yolks with the sifted salted egg and combine well with a whisk. Using the double boiling method, sit the bowl over a pot of simmering water and start whisking. While whisking slowly pour in the melted butter to incorporate it together with the yolk mixture. Make sure the butter & yolks are well combined while whisking through - there should be a uniform yellow color throughout. Add salt & pepper to taste. Continue whisking till it reached the jam consistency, then off the heat. A good way to gauge is to use a spoon and dip into the sauce. There should be a nice coat of the sauce on the back of the spoon which means the consistency is right. If it's too thick, dilute it with a few tsp of water. Sit it in a warm pot of water to retain the consistency. For the poached eggs, repeat step 1 from butter poached shrimps. Once the water temperature is on the right range, crack an egg in a bowl first, then from the bowl slide the egg into the pot of water. When the translucent egg white become firmer (able to hold its shape) and turn from opaque to white fully, remove it from the water using a straining ladle. Start assembling by, putting a layer of greens on the halved muffins. Then place 3 pieces of halved poached shrimps on the greens. 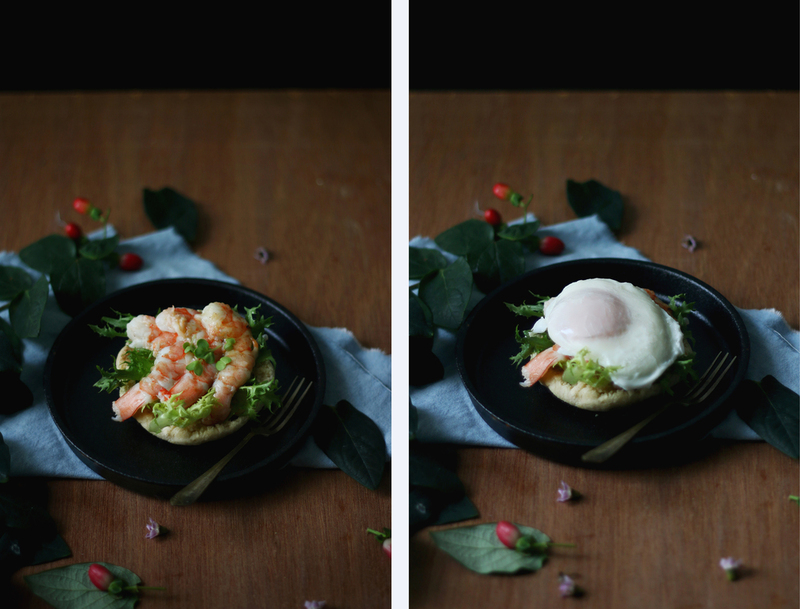 Place the poached eggs on the shrimps as a third layer & lastly finish it up with a spoon or 2 of salted egg yolk hollandaise which should be coating nicely on the egg. Garnish with some cayenne pepper & chives. And the amazing eggs bene is DONE! I really hope you guys try this out from scratch even for the english muffins. The satisfaction gained out of it is definitely worth it! Have fun & thanks for reading!